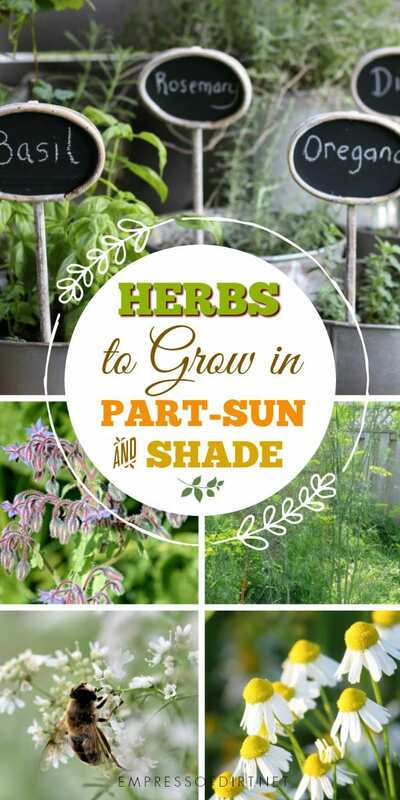 Herbs are naturally sun-lovers, doing best in full-sun growing conditions, but, there are some you can grow in part-shade. I’ll give you a list and some growing tips. 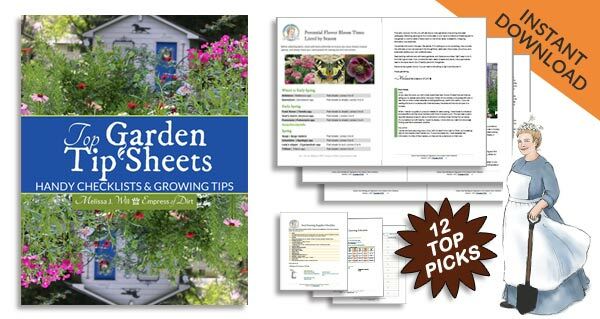 For more, see this complete guide to growing annual and perennial herbs. Some herbs are perennial (live for several years), and others are annual (completing their life cycle within one year), or biennial (a two-year life cycle), but no mater what, you can grow them in containers. When you purchase seeds or starter plants, check the tag or seed packet for growing instructions. This varies by climate and growing conditions. I grow herbs in containers to outsmart the sun. I move my containers around until I find that perfect amount of light that spurs growth without drying out the containers or causing the plants to bolt (premature flowering in response to stress). For example, sweet basil has the most delicious taste and scent when it is young and tender, but after repeated exposure to hot sun, it is repulsive and bitter. I can tell just by looking at the plant if it has crossed this line. To encourage new growth, I clip my herbs regularly. Regular cutting back encourages new leaves and discourages flowering and bolting. I created this chart (below) listing the preferred sun conditions for many herbs. Don’t take it as a rule book but just a general guide. Herbs are quite adaptable and while growth may vary, they do well in a variety of settings. The biggest risk with sunny growing spaces is the soil drying out and killing the plants. The downside of shade can be slower growth. Our goal, of course, is to find the happy compromise. Are you a tea drinker? You can also grow plants for making your own homegrown teas. Aha! A chart for sun needs!! Thank you kindly, Empress, for this secret information. I have always blasted the herbs with sunlight and hoped for the best. It doesn’t always go well. I love basil but I am sad to say that it can develop a slightly distasteful essence. Of course, I eat it anyway and dare anyone to mention that it might be getting a bit, er, strongish…but that is the sad truth. Things will go better now and there will be peace and sweet basil in the garden. I thank you, my family thanks you. May all of your future basil be sweet and delectable! I grow my basil in blasting sun on the south side of the house and it loves the heat. However, I do agree, it does pass a point and becomes too tough and bitter. This summer I have a succession of basil seedlings waiting in line to replace the gnarly old basil plants. Very smart to have the succession plants going! I’m good at that for salad greens but forget for herbs. Nice post! You made me laugh when you said ” I can tell with one look if it’s crossed the line”….almost like a naughty 4 year old…LOL I’m really loving the look of your herbs in those galvanized pots too…I am on the hunt for some, I need to go visit a salvage yard probably. 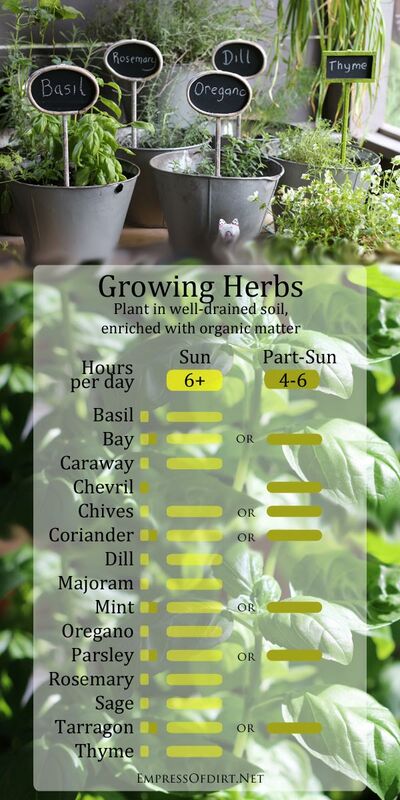 Great idea on sharing that general guide on sun for herbs….nice!